Can empathy enhancing VR really persuade us to care? The new battleground for animal rights is undoubtedly VR. 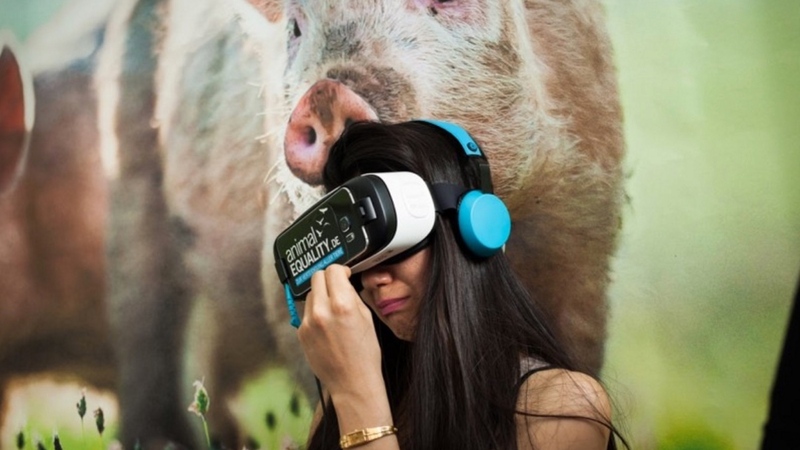 This July, Animal Equality released its third iAnimal virtual reality tour of conditions in dairy farms in Mexico, Germany and Britain. The first video in the series, which many peopel find shocking and disturbing, has had more than 63 million views. Similarly, a new VR video from Australian Beef following meat production from field to fork gets inside an industry notorious for functioning behind closed doors. The aims of these projects, and ones like them, range from shining a light on awful conditions to trying to persuade regular people to cut down on, or give up, meat entirely. But is VR more effective than traditional methods like TV spots, celebrity appeals and media focused stunts when it comes to persuasion or just a shiny new tool that campaigners and charities are getting to grips with? Back in 2014, the United Nations commissioned a series of films experienced entirely in VR. The UN Virtual Reality Series sort to push "the bounds of empathy" and reveal the human story behind global crisis, from the Gaza Strip to the victims of Ebola. One of the films was Clouds Over Sidra, the story of a 12-year-old girl in the Za'atari Refugee Camp in Jordan. A groundbreaking film, when it debuted at a screening for 'high level' donors it raised $3.8 billion in one night; it has been translated into 15 languages; UNICEF fundraisers screen the film in over 40 countries; and in New Zealand one in six people that viewed the eight-minute movie donated to the cause, that's two times more than any other film. David Cravinho, global funding specialist for UNICEF, has said that on average it will take a fundraiser between ten to thirteen interactions to get someone to sign up to become a regular donor. When VR content is used, that number drops to five or six. It's no wonder that other organisations and charitable/ ethical causes have followed in the UN's footsteps. Last year, non-profit Charity: Water, which builds water projects around the globe, held a similar VR-theatre gala in New York and Oculus' new VR for Good foundation supports various humanitarian programs. As Patrick Milling-Smith, president of Here Be Dragons, the Hollywood-based VR studio behind the UN series (previously Vrse.works), recently wrote, "You can't second screen a VR experience." That alone, though, is not reason enough for this modern wave of successfully persuasive videos. Research into the inner workings of charity campaigns that use VR is far from comprehensive. It's in marketing that the power of virtual reality and its potential for persuasion has ultimately been examined. Iis Tussyadiah is an assistant professor at the University of Surrey. Her work has explored the digital experience; in particular, the role spatial presence plays in influencing attitude and behaviour to tourist destinations. I asked Tussyadiah what her findings revealed about user experience and how this might relate to a VR experience of a refugee camp, as oppose to a tourist destination. "For users, VR gives an illusion that they have a first-hand experience in the virtual environment," she told Wareable. "An illusion of visiting a tourism destination, for example, can lead to an intention to actually visit the place and, I can imagine, if being used in social campaigns, similar effects will be generated." Tussyadiah says that through VR, you can 'transport' users to a different world. In this context, 'transported' is another way of saying that users have the sense of having visited these places. Tussyadiah calls this deep sense of immersion "being there" and argues that it's a cornerstone of what makes virtual reality so persuasive. "The sense of 'being' in a refugee camp, locating the self there, and being immersed in the situation, allows users to imagine how it is to be there and go through what the refugees had to experience," she told us. The potential for enhanced empathy isn't a given. The sense of 'being there' must be supported by the quality of stimuli (the 'realness' or vividness of the VR environment), interactivity, and believability; that is consistency between the mental image held by users about the place and how the place is portrayed in VR. Other factors can also disrupt the immersion and bring the user back to Earth, as it were. People chatting in the surroundings, any limitation on movement, and the sensation of motion sickness, are just a few examples. We tend to measure these positive and negative aspects of a VR experience in 'presence'. Professor Stuart Barnes, an expert in marketing at King's Business School, told us that, at its most basic, presence in virtual reality refers to the disappearance of the technology that is being used in the interaction. In this example, the headset of the virtual reality unit becomes 'invisible'. "Considering that marketing and charity work rely heavily on affective responses from consumers, the nature of a multi-sensory experience of presence can have a powerful impact on the way people think, feel and act," he said. "High quality VR experiences can provide a memorable and persuasive tool for influencing individuals." This is particularly so for VR experiences with interactive elements or with events linked to specific locations, as these are likely to be more memorable, thereby having a more lasting effect on people's behaviour. "Research suggests that VR environments can be designed for affective reactions, and that there is a direct link between presence and emotional response," he said. "There are many psychological factors that contribute to the development of presence. For example, the level of absorption or total attention that an individual experiences, their mental imagination, and how empathic they are can all influence the sense of 'being there'." The VR videos by the UN rely on visual stimulus alone but research into empathy and virtual reality reveals that interaction is a key element in order to stir people's hearts and minds. Stanford University's Virtual Human Interaction Lab (VHIL) has been studying VR and its emotional impact on people since the early 2000s. In particular, a research project called Empathy at Scale explores ways virtual reality can encourage people to behave in a certain way, typically for the greater good, and mostly pertaining to age or racial discrimination and environmental issues. To date, their experiments have found that: encountering a 65-year-old avatar of yourself inspires young people to save for retirement and that wielding a chainsaw and cutting down trees in an act of deforestation leads to 20% of participants reducing their paper use in day-to-day life. Early indicators also show that a homelessness simulation leads to a greater understanding and empathy towards someone who ends up on the streets. VHIL even found that putting people into a virtual reality Superman-flying simulator encourages real-world altruism. Lead researcher on the Empathy at Scale projects, Dr Jeremy Bailenson, has described this process of an individual's behaviour and attitude adapting, or conforming, to a digital self that they have virtually embodied, as the Proteus Effect (named after the Greek god who could morph into various forms). Applying this theory to people who are strapped into a first-hand experience of a refugee camp, for instance, it's easy to see how they too may think and feel like those they are walking amongst, and potentially perceiving to have now become via these virtual selves. Dr Paul Bloom, professor of psychology at Yale University and author of Against Empathy, has been a staunch sceptic of 'machines of empathy' to borrow the now famous phrase from Chris Milk, a VR pioneer who worked on Clouds Over Sidra and many other projects. Earlier this year in The Atlantic, Bloom wrote that "who we feel empathy for is strongly influenced by irrelevant factors such as race and attractiveness" and that "empathy often directs us in the wrong direction". In other words, empathy can lead us to lack a full understanding of someone's plight and feel a sense of pity instead. "Nobody," Bloom argued, "thinks that going downtown without your wallet will make you appreciate poverty - why should these simulations do any better?" With VR experiences creating messages with more impact and resulting in genuine benefits to campaigners, UNICEF and those following its example in charities and animal rights would no doubt disagree.